Playground Safety | Is Your Playground Safety Compliant? According to the U.S. Consumer Product Safety Commission, "About 200,000 children are treated in U.S. hospital emergency rooms for playground equipment-related injuries." 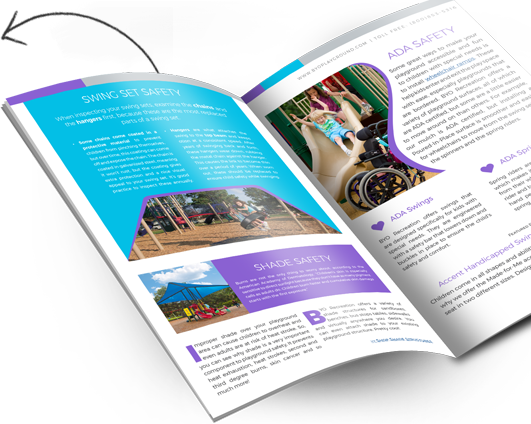 Keep your kids safer with the help of one of our certified playground safety inspectors in addition to Our FREE Playground Safety Guide. Know the best kinds of playground surfacing for your project and the distance the surfacing extends. Playground structure heights will also play an important role in the safety compliance of your surfacing to reduce the risk of child injury. Playground Structure Safety is one of the most important components of safety in a play space, so it’s important to know what you should be inspected to keep children safe at play. Our certified installers will ensure that your playground structure meets all playground safety standards. Swings are the most common playground equipment found in any play space, and it’s the most used structure by kids of all ages. It’s highly recommended that you should inspect your swings every month. Additionally, playground mats are a great way to slow surfacing erosion. Equitable play is an important and character building aspect of any playground. Whether your playground is at a daycare, in a park, at a school or your place of business, you should make sure that your playground equipment is ADA accessible so that you can accommodate every child. Make sure that you don't overlook shade when it comes to playground safety. Shade is a very important, if not the most important, safety feature on a playground. Protecting kids from harmful UV rays is vital. Moreover, many people don't realize just how HOT playground equipment and surfaces can get. Even adults must be wary of safety practices. Most fitness equipment is designed for particular ages and help promote a healthy lifestyle in your community. Outdoor fitness centers are great for parks or areas with a playground area because adults can exercise for free while their kids play. customizable. Custom create your dream playground with our flexible solutions. one-on-one with you to design your dream playground from scratch. The best way to ensure your playground equipment is safe for your children is with the help of our certified safety installers. National Playground Construction is a licensed CGC (Certified General Contractor), and all NPC installers are NPSI certified playground professionals and have collectively installed thousands of play spaces nationwide. Let your playground consultant know that you’re interested in our installation and playground safety inspection services! The National Program for Playground Safety keeps track of ASTM International’s over 12,500 voluntary consensus standards. We’ve taken the liberty of condensing those standards into an easy-to-read, no-stress guide. 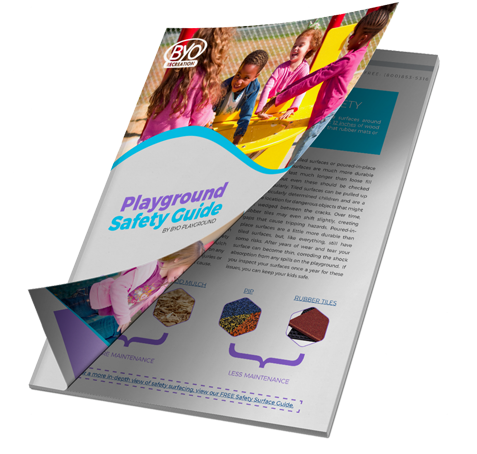 If you’d like to see the specifics, the Consumer Product Safety Commission put together the Public Playground Safety Handbook, which includes helpful charts, diagrams, and examples of proper playground safety practices. Making sure your kids are protected from bumps, scrapes and falls on the playground should always be a priority. BYO Recreation prides itself on safety certified and ADA playground equipment so you can create the safest play space possible. With our certified playground inspectors and our FREE Playground Safety Guide, staying compliant has never been easier.